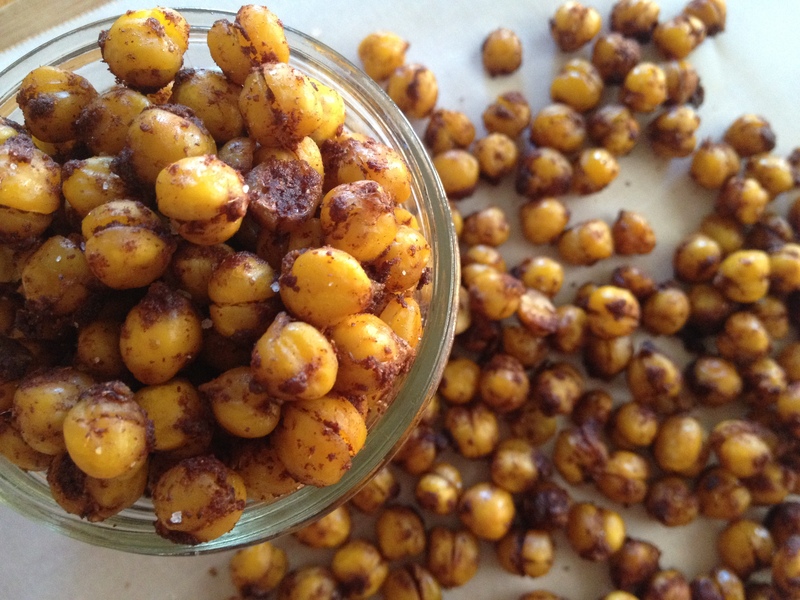 One of my favorite snacks would have to be roasted chickpeas because the flavor combinations are endless, they’re packed with protein, and are so easy to make. We’ve made them spicy, sweet, and “cheezy” – but this might be my favorite one yet. These are great on their own or with some banana nice cream or yogurt. Best off all, they’re toddler-approved! 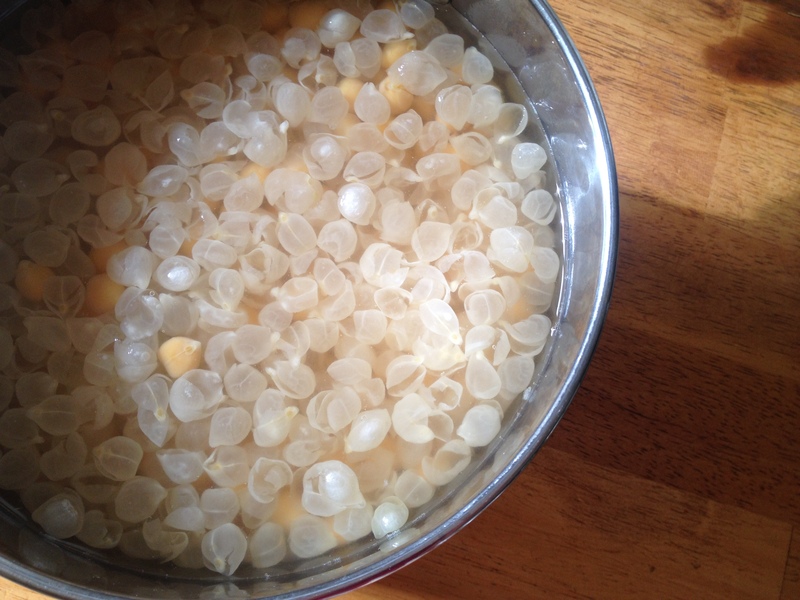 The outer layer (skin) peeled off of the chickpeas. Cook your chickpeas according to the package, or you can use canned. 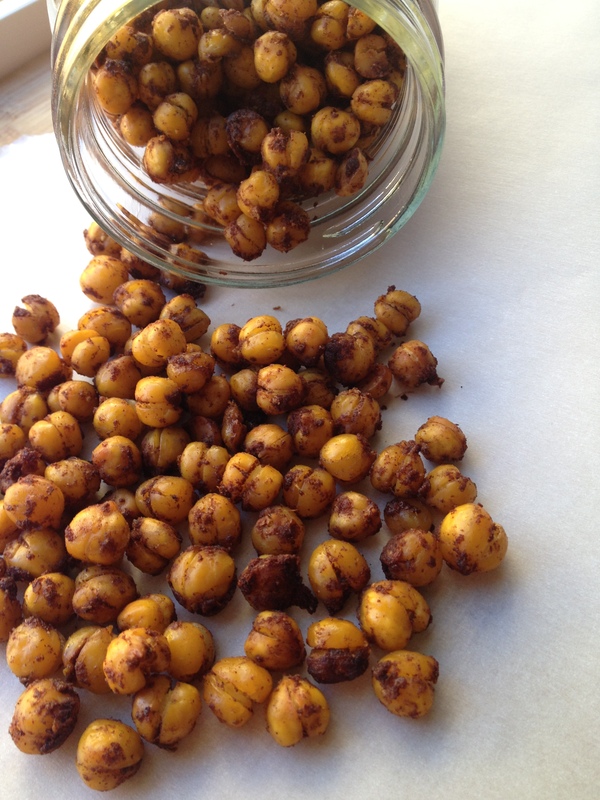 To achieve a crispier chickpea, I learned a few years ago to peel the outer layer (see above photo). It’s more effort and can be a bit time-consuming, but I promise, it is absolutely worth it. 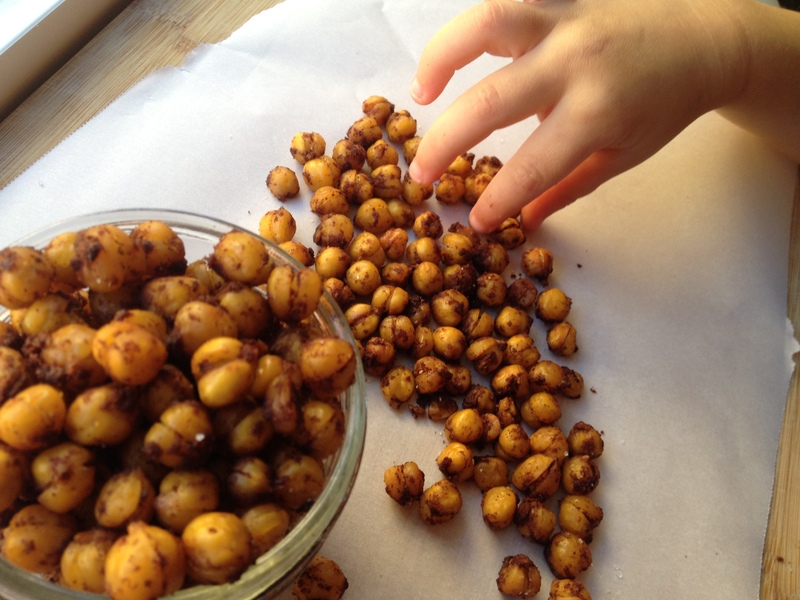 To peel it, just gently squeeze the chickpea or roll it between a couple towels…the skin should come right off. Remember, you don’t have to peel them, it’s just a recommendation. 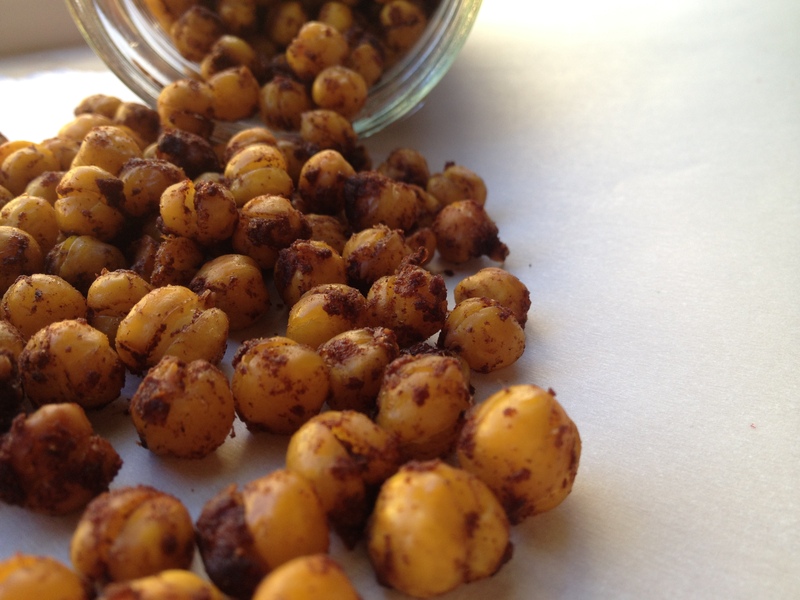 Place the chickpeas in a medium-sized mixing bowl and add the coconut sugar, cinnamon, mesquite powder, and salt. Stir until evenly coated. Next pour in the melted coconut oil and stir until well combined. 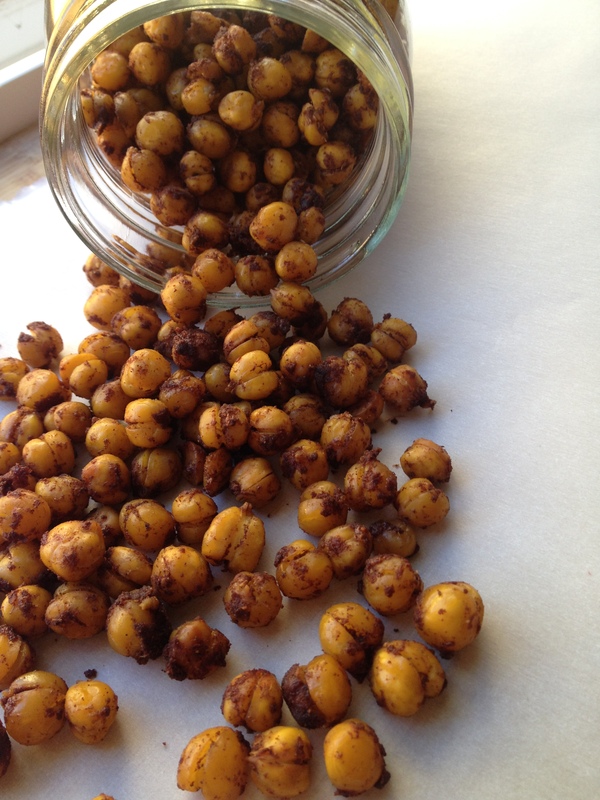 On a parchment lined baking sheet, evenly spread out the chickpeas into one layer. Bake for 35-40 minutes or until crisp. Stir/flip them halfway through. Remove from oven and allow to cool on the baking sheet for at least 10 minutes. Once cooled a bit, you can sprinkle additional cinnamon, coconut sugar, and/or salt if you’d like. * We use Oijo brand mesquite powder, but have also used Terrasoul – both are of excellent quality and are organic and raw. Crispy, slightly sweet, with just the right amount of cinnamon. Little fingers kept grabbing for more while I was trying to take pictures! 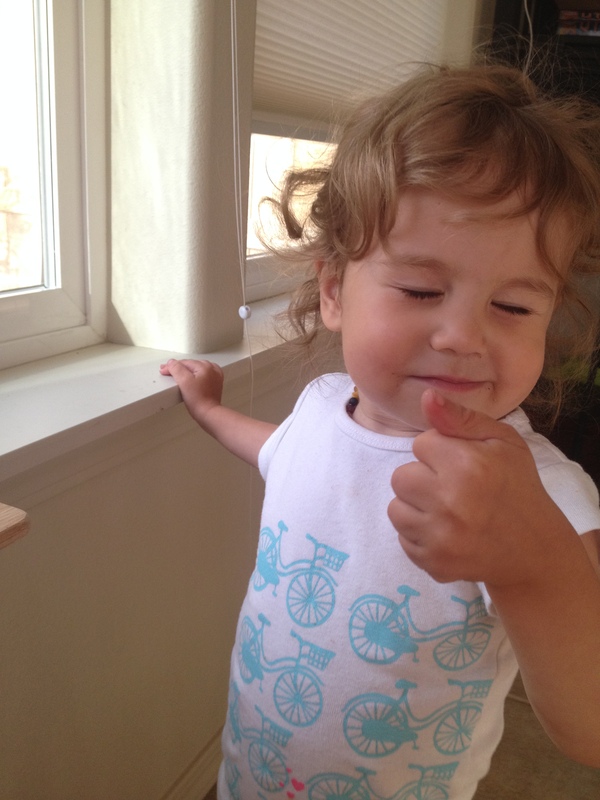 When I asked Willow if they were good, she gave me a thumbs up! She devoured most of this batch in one day. Let them cool completely before storing them, otherwise they lose that crispiness. For best flavor, I recommend storing them in a glass jar. In the off-chance that they survive past the date of making them, they will last for 2-3 days if stored in a tightly sealed jar. I was wondering if I could try Cinnamon Roasted Red Kidney Beans? Awwwww! Thank you!! I’ve never even thought to roast kidney beans…if you try it, will you please let me know how they turn out?! I have just found them to be much softer than chickpeas, so I wasn’t sure if they would crisp up as nice. Keep me posted!!! I would par-boil and then fry the red kidney beans, will not soften them too much.. I have GOT to make this! Thanks for sharing! Would be great for a fall snack. I hope you try them!! Let me know if you do 🙂 We don’t use the oven that much in the summer, as we don’t have AC, but come fall, we’ll be roasting lots of chickpeas and other fun snacks!! Hope you have a great day! !